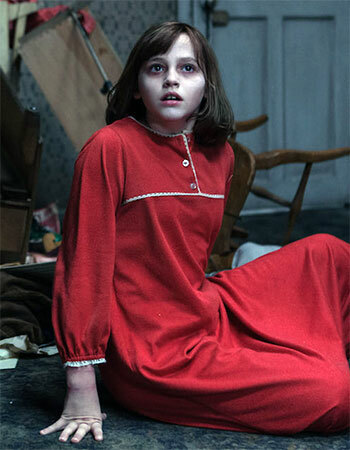 An unlikely combination of ingredients is what brings out Conjuring 2’s gloomy, dark power, feels Shubir Rishi/Rediff.com. The original Conjuring about a haunted farmhouse somewhere in America was one of the better movies of the horror genre to come along in a long time. And, like it usually happens with sequels, I expected it to fail. It is pleasantly surprising that the makers got it right. The sequel is set in 1977, seven years after the original events take place, and the set decorations are just right, without going aboard with the period design. Patric Wilson and Vera Fermiga reprise their roles as Ed and Lorraine Warren, the paranormal investigators chasing down a spook show taking place in a certain North London house. They, like the rest of the actors, are fantastically cast. Everyone enjoys a movie when the chemistry between a married couple is like magic (Ki & Ka this is not), and these two play it with real faith, conviction and sobriety. And they are often quite funny. This movie probably wouldn’t have worked without them. The house itself is an extraordinary creation and I am surprised it wasn’t credited as a member of the cast. That, combined with cinematography that is both eerie and haunting, and the sound design by Joseph Bishara (who also worked on the original and in other minor gems such as Insidious), really does send a shiver up your spine. No shadow, no sound, not a single detail is out of place as we go from incident to incident... that is the where the real fun lies. A floorboard squeaks, a backyard swing creaks in between long silences and all that is very unsettling, very unnerving indeed. The atmospherics are, simply put, fantastic. The intensity just builds and builds without you actually realising it until it hits you in the face when you are least expecting it. The entire cast (including the house) work as a tight-knit unit and the camera helps, somehow moving, prowling through floorboards and towards them, keeping outside a force that is struggling to be let in, barely containing itself. Without divulging too much about the story (well, where is the fun in that? ), here goes. There is a single mother (Frances O'Connor) with her four children who have been experiencing very violent goings in, on and around their surroundings. True, the possessions get a tad repetitive and the jump scares do make you numb, but they are well-balanced by the entry of a very ambiguous third investigator (Simon McBurney). Don't get hung up on the little things, the accuracy... just let the movie work its magic. This is exactly what is expected of Conjuring 2 and it satisfies. And you never know, there might be another one in the making. This is a movie even non-horror fans can appreciate. It is classic old-school horror; a deep dive into dread.